When we designed RFQ, we wanted it to have the same average value and range as RFV so that RFQ could be substituted for RFV with numbers having the same economic and management criteria. To determine the relationship between the two indices, we compared the 200 samples from the Worlds Forage Superbowl at World Dairy Expo. These samples came from 20 states and two Canadian provinces in 2002. The RFV mean was 179 and was not significantly different from the RFQ mean of 172. The graph below also shows that the range was similar. The slope of the line was 1.14 indicating that RFQ tended to be lower than RFV for samples with values less than 175. The overall correlation was moderate (r2 = 0.86) due to the large range of data values. Most importantly, RFQ of individual samples varied by as much as 40 points higher or lower than RFV, and 22% of the samples varied by 20 points or more, as shown on the graph. When RFQ differs from RFV, the fiber digestibility was not ‘average.’ Where RFQ was higher than RFV, the hay seller could have gotten more for the hay (or the buyer got a good deal) and where RFQ was lower than RFV the cows would not have milked as expected. 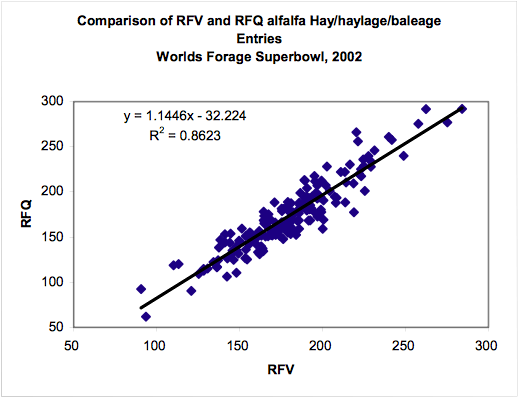 Similar results have been seen when comparing RFV and RFQ every year through the 2005 contests. The graph shows that the line comparing the two does not go through 0. We have always recommended only using RFV and RFQ in the range of 75 to 200 where the indices are a reasonable approximation of the animal response curve. Outside this range neither indices relate to animal performance. RFV and RFQ are the same for alfalfa when digestibility is average. RFQ appears to be a better index whenever fiber digestibility is not average, which occurs 20 to 40% of the time in pure alfalfa. It is also a better index when grass is present because, while grass has higher fiber content than alfalfa, the fiber is more digestible. This means that higher fiber grasses perform similarly to lower fiber legumes in animal rations. RFQ makes this adjustment while RFV does not.